Technical analyst Rahul Mohinder has maintained 'buy' rating on Chambal Fertilisers & Chemicals Limited with a target of Rs 91. According to analyst, the investors can buy the stock with a stop loss of Rs 78. Mr. Mohinder said that the said target can be attained in two trading sessions. The stock of the company, on December 14, closed at Rs 82 on the Bombay Stock Exchange (BSE). Current EPS & P/E ratio stood at 6.60 and 12.77 respectively. For July-September quarter of 2010, Chambal Fertilisers and Chemicals Ltd has registered a 33% increase in its net profit, which stood at Rs 86 crore. The company recorded such growth on account of bettered sale figures. In the corresponding period of last year, the company registered a net profit of Rs 64.61 crore. The net sales of the company increased to Rs 1,535 crore in the three month period under review as against Rs 957 crore in the same quarter a year-ago. 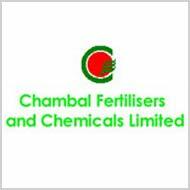 Chambal Fertilisers & Chemicals Limited is one of the largest private sector fertilizer producers of India. The company's two ultra-modern nitrogenous fertiliser (urea) plants are situated at Gadepan in Rajasthan's Kota region.